This is a monthly swap, it's an easy one for those who want to find new pen pals. I imagine this kind of swap to create a regular pen pal list, but point 3 is up to you. WHAT SHOULD YOU PUT IN THE ENVELOPE? Remember to include swap name and your swap bot user name. I also prepared a free printable writing set kit. It's not required to use this set. Get the free kit here: FREEBIES! 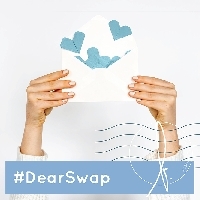 BE SOCIAL: if you share some pic about this swap on Social Network, please use #DearSwap so everyone in the community can see your creations!